Semper Fi Fleet Maintenance Service LLC Offers Mobile Truck and Trailer Repair You Can Count On! We Offer a FREE Fleet Assessment. An inspection of all your vehicles with no obligation! 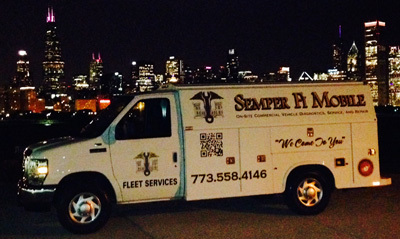 Since 2012, Semper Fi Fleet Maintenance Service LLC has provided fleet vehicles in the Chicago, IL area with comprehensive repair services that include Fleet Brakes, Fleet Drive Train, Fleet Electrical, Fleet Electronics, Fleet Engine Work, Fleet Front End Services, Fleet General Services, Fleet Suspension Work, Fleet Tires, Fleet Trailer Work, Fleet Welding Services and Fleet Wheel Services. Our goal is to offer the best services available at affordable prices to get you back on the road in no time. We can maintain your fleet vehicles by tracking the preventative maintenance schedule and letting you know when it's time for service. Besides preventative maintenance, we can take care of everything from minor repairs to major repairs. We take the headaches out of maintaining your fleet! If you already have a fleet manager or mechanics on staff, no problem! We can provide overflow service to get your mechanics caught up. Our Service vehicles are specially designed and equipped to perform up to 85% of all vehicle maintenance and repair requirements ON-SITE. Waste oil is pumped into onboard holding tanks and disposed of in an environmentally friendly manner. Semper Fi Fleet Maintenance Service LLC strives to have service technicians with high training levels and experience. Our technicians are qualified in both gas and diesel engine maintenance and repair. All of our technicians are provided continued training in all new technology and vehicle changes and updates. All of our technicians meet the DOT and air brake certifications. We also have a technician on staff who is state certified in Compressed Natural Gas. Certificates are available for review upon request. In addition to coverage on each service vehicle, Semper Fi Fleet Maintenance Service LLC maintains garage keepers insurance and $2,000,000.00 comprehensive general liability coverage for our protection. Certificate of insurance available upon request. Semper Fi Fleet Maintenance Service LLC uses only high quality parts. All parts installed are backed, generally, by a manufacturer replacement guarantee. All truck repairs, trailer repairs and vehicle services are guaranteed. For a high-performing vehicle, trust Semper Fi Fleet Maintenance Service LLC with your repair needs. To learn more about the services we offer, please contact us by phone at 872-228-7825 or send us an email. We also invite you to learn more about our dedication to you, our valued customer.